In order to guarantee the quality of our services, rigorous controls are made with sophisticated automated machines, such as the MIRTEC viewer or the TAKAYA mobile probe tester. Human-led controls are realized in complement of those operation machines to check difficultly accessible components or product assembly conformity in relation to the manufacturing files. Functional electric tests and/or mechanic tests are proposed as an additional option. They are realized by our technicians on test banks either provided by the client or developed by us. For each production, we include AOI controls (automatized optic test). 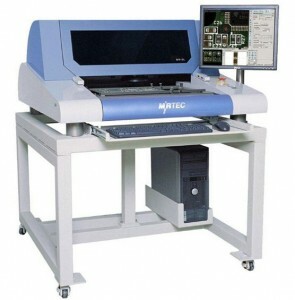 They are 100% realized on cabled cards with SMD components (Surface Mounting Devices) by the MIRTEC automaton. 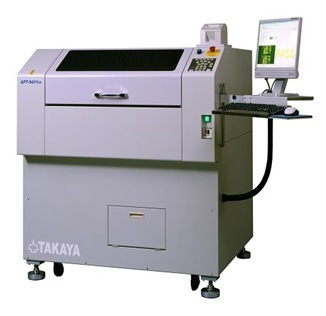 We verify traditional components with a serial 9400 TAKAYA mobile probe tester. Those controls guarantee the quality of welds as well as the presence of components, mounted by automatons installing SMD (Surface Mounting Devices) components and manufacturing operators. An IN-SITU control will be complementary to our basic services and will be realizable to verify components values. Electric tests (capacity, short circuit etc) are also possible, realized with the TAKAYA tester. During a new manufacture, the first product of the series always undergoes our technicians’ analysis before launching the complete series. This allows to validate the manufacture and to start the series serenely. Our technicians’ team is experimented and is capable to realize card tests according to your internal procedures or according to the manufacturing files that were established for the project. The test banks can be provided by you or created by us. We offer electric tests with beams thank to our SYNOR automate. This machine, once programmed, verifies the electric continuity and isolation (absence of short-circuit) from point to point. Dismantling and traction tests are realized according to your criteria, with different applied strengths according to crimping type. We also propose tailor-made sealing tests on cables.